Whenever I play the Cypher System (which includes Numenera and The Strange) I try to make sure that each player gets nailed with a GM Intrusion at least once per session. The timing of these events can vary, but I'm definitely going to dole one out if a player gives me any kind of cue. So last night, when Marc made a comment about a weird light that was just background filler in the "show 'em" picture I screen shared, I decided to nail his character with... THE BOX! Level 5. A small, metallic eyeball opens near the character and projects a 2 meter x 2 meter laser cube around the target. Anything toughing one of the cube walls instantly takes 5 points of damage as the laser vaporizes flesh and metal alike. The only way to disengage the device is to have two objects touch opposing sides of the cube at the exact same time. So this most likely means that two of your PC's need to touch each side. If they don't do it within a split-second of one another, they each take 5 points of damage (if using a hand or finger.) Last night I let them use items too but hell, be a mean GM and make them use their own flesh. Force them to put some skin in the game! My crew spent ten minutes trying to work out a system to touch the two sides simultaneously. So beautiful to watch them squirm! The would-be rebels, three of whom still suffered from nagaina defender parasites, did some last minute shopping in Uxphon before setting out for the subterranean conveyance that would take them far into the Black Riage. The "Catena", an eons old hover train, rested only a few miles from the city of Uxphon, hidden deep within unexplored tunnels and tubes. Five cars long, the Catena was held in place by three massive, sixty foot long clamps. To travel via the device, the team would need to disengage the clamps. PL4T0 started to explore the area when he accidentally set off an ancient device, trapping itself within a large laser cube (THE BOX!) The silicon drone was eventually freed by Ruun and Keane using the method described above. Continuing to explore, PL4T0 discovered a large lever connected to the rearmost clamp connected to the Catena. The group then slid down the clamp onto the train itself and searched for a means of entrance. Although it almost cost him his life in a terrible fall, Belmodan managed to find a door to the frontmost car. Once inside, PL4T0 interfaced with the long dormant onboard computer. The AI's name was C01133N (Colleen), and "she" was completely enamored by PL4T0. Maybe it was PL4T0's suave interfacing, its sensual filament, or just the fact that the hovering automaton's player rolled a natural 20. Whatever the case, C01133N assisted the team in gaining access to the Catena, and disengaging all of the cars save for the one in the front. Unable to find a lever to disconnect the frontmost clamp, Belmodan sprayed the connection with a whole mess o' Friction Reducing Gel, and the team was off! About an hour into their trip, the team heard several thumps on the roof of the Catena car. Belmodan peered outside and saw that three greenish, headless, gelatin looking, entities were climbing atop the moving conveyance. These Tactile Explorers were extensions of the Insidious Choir, and were a grave threat, and needed to be dealt with immediately. Although the battle almost cost Ruun his life twice (once by getting knocked almost off the train car, and again when he inhaled a bunch of airborne virus goo), the team prevailed and continued to the opposing Catena station unimpeded. Jim - "You're trapped in a box." Marc - "Like Gwyneth Paltrow's head." "He's got little Trump hands." - Will describing PL4T0's arms. "It's only 'foraging' if you intend to eat Belmodan." - Jim to Will, a commentary on Ruun's diet and survival habits. Marc - "You're making it weird." Jim - "Isn't that what Numenera is all about." Now that we finished The Ooze Pits of Jonas Gralk, our tour of +Jon Marr's delightful Sunken City Omnibus must continue forward. The third adventure in the omnibus, A Gathering of the Marked, is a 0-level funnel that brings together a troupe of "marked" individuals, all being subconsciously driven towards a cursed manor in the Sunken City region. Rather than find a way to connect our previous characters, I opted to give my players the chance to create three new 0-level characters. We agreed that whoever survived the adventure would be elevated to 2nd level, and be given the opportunity to take a place in The Free Company. After reading A Gathering of the Marked I figured that we'd need more than one session to complete the adventure. Most likely two or three. So right now the plan is to let the players advance their survivors to 1st level at the end of our first session, and then 2nd once they complete the quest. For some reason, last night's game became a bit of a bloodbath... and not because of the adventure, but rather the party infighting. Of the eight character deaths, four were directly as a result of the PC's going after each other. What a shame. This whole "second funnel' concept was to give the players another PC to use in future games. A "character tree", akin to what the old Dark Sun campaign setting championed. Unfortunately, some of the best and brightest PC's fell along the path towards the gloomy manor house in this first session. In lieu of our typical characters, this week the players each rolled up a trio of 0-level commoners, peasants, and peons, each one bearing a strange mark on his head. Twelve individuals use the Sending Stone on the outskirts of the Great City, to travel into the depths of the Sunken City. Although none of the individuals know each other at first, they all bare the same circular mark on their forehead. Several of the travelers hypothesize that it is the mysterious mark that generates their compulsion to travel to the darkest depths of the Sunken City, towards an unknown final destination. Once they collect themselves, the party sets out towards an abandoned village. Along the way, a spectral girl appears and points towards Garik. She motions to be quiet, an then disappears in a puff of smoke. She leaves behind a rough map of the region. Following the map, the party enters the old village. All of the buildings are in complete disrepair, save for one. On the porch of that last, intact house is a man holding a wooden pirate puppet. A voice calls out to the party, but it seems to come from the puppet and not the man. The man just continues to smile blankly, and rock the chair. The puppet introduces himself as Commodore Teak, and he offers some wisdom concerning the town. The party pays him no mind, and explores the town. An old, graveyard themed tavern (complete with coffin tables), yields a few bottles of fine alcohol, yet the disembodied hand crawling around in the corner is a bit disconcerting. After leaving the tavern, Horace Goodspeed decides that he wants Commodore Teak's hat. The ostler marches right up to the puppet and grabs his nautical themed hat. "Wrong f***ing move, there sir!" the Commodore shouts as he chops off Horace's arm with one single swipe of a tiny cutlass. The ostler falls to the ground and bleeds out. There is a large pit in the center of the village. The Commodore calls out that the party needs to sacrifice one of their own into the pit to move forward. Cousin Dan takes note that Nathe is standing too close to the pit, so he charges forward, pushing the poor caravan guard into the gaping maw. Nathe screams out as he falls, but something catches him. A voice whispers, "grab my hand." Again the voice whispers, "grab my hand." Nathe reaches out, and grabs on to a wooden hand. "Wrong f***ing move, there sir!" the Commodore calls, as his wooden head appears in the pit. Nathe is then dragged deeper down. As soon as this occurs, a series of shambling, grassy, horrors appear at the edges of the village, moving towards the party. Everyone starts to run north. Almost everyone makes it, as one of the horrors grabs Crazy Tommy, carrying him away. After fleeing the shambling horrors, the party takes the path to the northeast and comes to a small lake. Near the lake, a group of priests is kidnapping some fishermen. The party intervenes, slaying the priests quickly, grabbing their gear, and then forcing the fishermen to give them a lift across the river. The trip across the river is not without its challenges. A terrible, tentacled monstrosity appears in the water! The party tries fighting the beast off, but it succeeds in devouring both Maximillian and John McIntyre. On the other side of the river, the party takes stock of their situation. A small road leads to a dilapidated manor in the distance. A fountain near to the path seems to be spewing some kind of "crablike" creatures, so the party decides to circumvent the threat, and try a rear entrance. The path in the back of the manor is much steeper, and as the party begins to climb, they hear a pair of voices calling out from the bottom of an adjacent ravine. The voices claim to belong to the bodies of two dead adventurers. They each request assistance in being properly buried, and offer to give the party information pertaining to their trek, as well as directions to some hidden treasure. What happens next still does not make sense. Mij helps to lower Cousin Dan (who the party already realizes is psychotic) to the bottom of the ravine with some tied off fabric. Cousin Dan checks the bodies, realizes that he has nothing to bury them with, and asks for the rest of the party to pull up the corpses so that they can be buried somewhere else. Mij refuses, and pulls up the fabric cord, leaving Cousin Dan at the bottom of the ravine. Cousin Dan gets angry, and starts demanding assistance. Everyone in the party watches as Mij continues to refuse. Cousin Dan then takes a grappling hook and uses it like a claw to help climb to the top of the ravine. He's cursing the entire time, threatening Mij. Floyd Pink takes this as a threat to the entire party, so he stabs and kills Cousin Dan as soon as he reaches the top. That's when the rock demon appears! The battle with the rock demon is swift but terrible. It kills Heribert outright, and Mij is killed by Mej, who fires into the melee. The party does eventually defeat the rock demon, but in the end is left with only four of twelve adventurers. The team will need to convince the fishermen to tag along if their numbers are going to be reinforced! Despite the loss of life in this adventure, I don't think A Gathering of the Marked is especially brutal by design. Most of the killing occurred due to poor luck and/or choices along the way. There were several opportunities for the PC's to make better choices, but they chose otherwise. I should also note that I didn't add much to this session. Besides a few minor twists, I ran everything "stock," just as the Purple Sorcerer designed. At the end of the session, I let the players level-up their survivors. We got two Warriors, a Dwarf, and a Wizard. They should compliment The Free Company nicely, if they all survive! To add a bit more meat to the party, I also let the players roll up one additional 0-level character each, to represent the four fishermen saved towards the end of the session. "I'm not gonna eat it, I'm gonna taste it. Just gonna give it a little lick." - Horace didn't know that no one ever survived a funnel by licking stuff. Andy - "Lead the way sir." Alex - "No, candlemakers first." Andy - "I've never heard of that custom!" "We just nominated you, old coot! It's time to go in the pit, let's go!" - Cousin Dan to Ol' Gus. "I was trying to get the testicles, but couldn't reach!" - Cousin Dan, after skewering a priest's thigh with a pitchfork. "I make it up there, you're dead!" - Cousin Dan to the rest of the party. He didn't make it up there. Okay, I'm going to keep this post light and short, just because of how tired I am. It's been a pretty rough day on my end. Flat tire in the morning, crazy day at work, lots going on on the social media'ing, and then my wife and I had our monthly event with the Norwin Game Knights. I was tired when I rolled into the club event, and there was a bit of dread that rolled over me as I realized that we were heavy on players but short on GM's. All in all, we had around fifteen total players interested in gaming with us, and only me and my daughter Evie were prepared to run anything. So Evie broke out her own, homebrewed, No Thank You, Evil! adventure and I grabbed Prince Charming Reanimator by Daniel Bishop. Evie took three of the players, and I took the other twelve. Great night of gaming, but my voice is about done! As I mentioned, I'm pretty zonked, but I do want to make a few points about Prince Charming Reanimator. First, it's a Dungeon Crawl Classics 0-level funnel adventure published by Purple Duck games. Just like many of the Goodman Games 0-level adventures, this one is over the top, full of peril, and great for a group of newbies who are trying out DCCRPG for the first time. But it's the theme of Prince Charming Reanimator that makes it stand out for me amongst other DCCRPG modules. Our family just got back from Disney World last Sunday, and I was in the mood for something fanciful and light, but also a bit twisted. Prince Charming Reanimator definitely fit the bill. In the game, the PC's have been conscripted by Prince Charming to locate a beautiful, seemingly dead maiden so that he may have her hand in marriage. Apparently there are a whole mess of dead maidens that Prince Charming found himself with, some that he raised from the dead after falling to terrible, fairytale ends. The adventure is bloodbath! We had twenty-three PC's to start, with another four added during the course of the game. Nineteen total 0-level PC's lost their lives. The adventure recommends letting the players level up their characters as the game progresses. I can't recommend this strongly enough. If you are interested in having Prince Charming Reanimator kick off a brand new campaign, please let your players level up their characters before the last sequence! For our one-shot, everything worked out well. During the battle with the Rose Dragon, Kim Jong Il wielded a fiery magic sword but died quickly. Not to fear, as the party's resident dentist, Herbie, picked up the former North Korean dictator's magic blade, and performed the death blow on the dragon. Huzzah! Rather than handing over Beauty to the Prince, Slim Shady kissed her himself. Spoiler Alert: not a good option! If you are familiar with the adventure, read the flavor text that describes this sequence, but insert "Slim Shady" for every "Prince Charming." The players loved it! As I said, short post. Prince Charming Reanimator is "Pay What You Want" on DriveThruRPG, but give them some love. The adventure is well worth it, and I can't wait to try it again! Playing RPG's while on vacation is a tradition for our family. We like to call this #GetOutAndGame'ing. 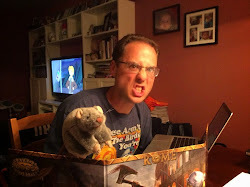 Whether we're playing No Thank You Evil in the Magic Kingdom, or Savage Worlds on a Delaware beach, each time we travel we typically pack an adventure or two. This past week our family traveled to Disney World with something different planned for this traditional feature. In previous #GetOutAndGame blog posts we've shared our excursion and highlights from our adventure, but there was no way for you, our readers, to be a part of our world. This time I wrote something specifically that you can play with your own friends and family. All you need to do is print out this blog post, and you'll have a complete adventure at your fingertips! Not wanting to step on any IP toes, I made sure to make this adventure post as "theme park neutral" as possible. Judges and GM's can feel free to add influence from their favorite, childhood amusement parks, and it should work just fine. Take your most special memories, submerge them in fifty feet of water, and have at it! As I wrote down some notes for this adventure, I realized that it was looking more like a hex-crawl... albeit a very watery, sea-based hex-crawl. 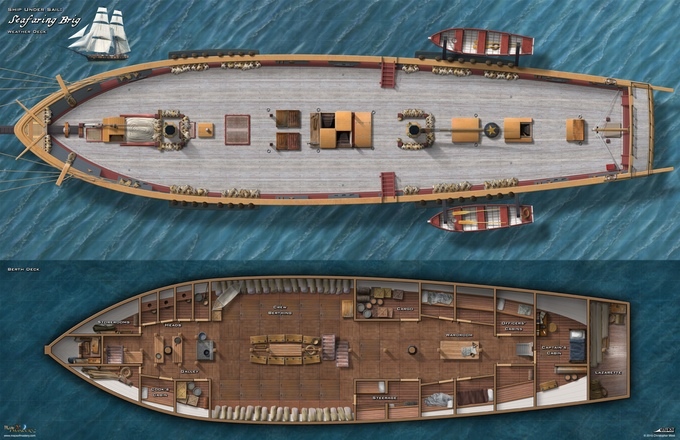 This brought me back to one of the coolest maps I've seen recently, a recreation of the Brig Niagara by cartographer +Christopher West. That big, beautiful boat had to be a part of this adventure as well. Sometime in the future, not long after the Great Disaster, vast areas of Terra A.D. are submerged by a furious, briny deluge. Given the general proximity between the world's theme parks and the sea, many of these once festive locales are now sunken graveyards of yesterday's laughter and joy. But the advanced technology used to power these attractions may still be of some worth, providing riches and artifacts to those brave enough to explore the haunted depths. A Great Big Nuclear Tomorrow is an aquatic hex-crawl 0-level funnel adventure designed for Mutant Crawl Classics RPG as outlined in the Goodman Games Gen Con 2016 Program Guide. The adventure, just like MCCRPG, is 100% compatible with Dungeon Crawl Classics RPG. If using the latter, I highly recommend including +Reid San Filippo's Crawling Under a Broken Moon rules to give the adventure a proper, post apocalyptic tone. For me, I think the proper feel should be Bioshock meets It's a Small World. Use the free MCC-Preview document to create your own mutants, plantients, and pure strain human heroes. Go visit the Purple Sorcerer's 0-level party generator and set the source to Crawling Under a Broken Moon. For a more twisted take, there is a list of Disney-themed 0-level occupations featured right here on Living 4 Crits. The PC's, part of a seafaring tribe, have discovered a chart that leads to a network of sunken structures, each one rich with powerful artifacts and technology. The chieftain of the PC's village grants the explorers a great sailing vessel, in return for half of all that is discovered beneath the waves. Travel to the sunken theme park should take the better part of a week. Feel free to add more to make this your own. Alternatively, there are some plot pointers in the Celebrate America! encounter. Judges are encouraged to create their own crazy sea encounters that could occur en route to the sunken theme park. This is just a sample image, and the complete map can be purchased here at Maps of Mastery. I was a proud backer of Chris' project, and was REALLY impressed with how the map turned out. Great work, sir! "Drowning: A submerged PC without an air source can hold his breath for as many rounds as his Stamina score. If he engages in actions while submerged, this duration is halved. Once this time limit expires, the PC begins drowning and must make a DC 10 Fortitude save each round or temporarily lose 1 point of Stamina. The save DC increases by 1 each round after the first. A drowning PC can take no actions and must be rescued by another character. When a PC’s Stamina reaches 0, he dies. If the PC is rescued, the lost Stamina is restored immediately." This adventure is a series of random, sea-based, theme-park-themed encounters. Judges are encouraged to set this adventure on the waves above their favorite attraction, or base it on their own creations. Every 1d6 turns the judge rolls 1d12 and consults the list below. Repeat events are at the discretion of the judge. Perhaps the PC's are lost, or maybe they find a similar locale. Just before the Great Disaster most theme parks were staffed by dozens of animatronic automatons that would greet guests, take pictures, and take part in various performances. Not quite AI, these robots could perform simple acts of entertainment, while appearing lifelike and jovial. As the world of the ancients ended, many of these animatronic creations remained active, their nuclear batteries designed to last for centuries. Judges are encouraged to come up with their own fictional characters that are represented by the Atomic Animatronics. Or just use versions from your favorite, family amusement park! The PC's find a location inhabited by Atomic Animatronics. Roll 1d4 to determine the location and situation. Pizza Den - Idea by Scott Robinson: The PC's discover an undersea pizza den still staffed by 2d6 Atomic Animatronics. There is rooftop access to the den floor through a ventilation shaft. Once in the main area, the PC's find the animatronics still at work. Half of the robots are performing a terrible live show on a stage in front of dilapidated tables and chairs, lit only by the shadowy sunlight cutting through the waves above. The other half are trying to make pizzas... poorly. There is no light in the facility, and no food or supplies other than pots and pans. So the remaining animatronics don't have anything to work with, until now. Once the PC's are spotted, the animatronics rush them in order to turn their organic material into pizza. Stage Performance: A floating stage can be seen 3d100 feet ahead in the water. 1d6 Atomic Animatronics are standing on a broken wooden sign, 10' x 30', performing a live comedy skit. The language of the animatronics is an ancient tongue, so there is a high likelihood that the PC's have no idea what is being said. The animatronics have no interest in the party, and will not attack unless forced to defend themselves. The robotic actors possess a single hat containing 6d6 pieces of old coinage. Sentient Hermit Animatronic: The PC's approach a small dinghy crewed by a single Atomic Animatronic named "The Rabbit." The Rabbit is completely self aware, and is attempting to leave the area in search of a new powerplant. The Rabbit explains that it has only enough nuclear power left in its battery for another six months. The PC's can choose to aid the Rabbit, or leave it go. But if it is brought along for the ride on the big boat, it offers its services to the PC with the highest Personality. Itty Bitty Song & Dance - Idea by Yorrus Rex: The PC's come across a great cave network, sticking out of the water. They can choose to enter the long, 300' long passage, but will find that they are beset upon on all sides by small, 12" tall miniature Atomic Animatronics. The tiny creations keep singing the same annoying song over and over again. 2d4 attack the PC's for every 50' they travel into the Itty Bitty Song & Dance cave. As the PC's survive each 50' segment, reward them with swag from Table 1-4, Additional Beginning Equipment from the MCCRPG preview. Two rolls per 50' should be fair. Atomic Animatronic: Init +0; Atk punch +2 melee (1d6), or laser eyes +2 ranged (1d10); AC 14; HD 2d8 (10); MV 30' (15' under water); Act d20; SP: Robot. Immune to all mind affecting powers. Upon destruction, nuclear battery may detonate. PC making the killing blow must roll a Luck check. If failed, the Atomic Animatronic explodes in a mini-nuclear blast, causing 1d4 points of radiation damage to everyone within 20'. SV Fort +3, Ref +0, Will +1. AL N.
Itty Bitty Atomic Animatronic: Init +0; Atk punch +1 melee (1d3), or laser eyes +1 ranged (1d6); AC 12; HD 1d4 (2); MV 15' (15' under water); Act d20; SP: Robot. Immune to all mind affecting powers. Upon destruction, nuclear battery may detonate. PC making the killing blow must roll a Luck check. If failed, the Itty Bitty Atomic Animatronic explodes in an itty bitty mini-nuclear blast, causing 1 point of radiation damage to everyone within 20'. SV Fort +1, Ref +2, Will +1. AL N.
This towering structure is Inhabited by the Logue-Folk: very dense, woody plantients. 5d8 total Logue-Folk inhabit the top of Mauler Mountain, which juts up 100' above the waves. There are at least half a dozen caves in the great, plasteel structure, each one practically infested with Logue-Folk. Mauler Mountain was once the theme park's highest's, mountain-based log flume, and a very popular ride. Now all that remains is about 200' log flume passages that marked the high point of the ride. The Logue-Folk have turned the access areas surrounding these passages into living quarters. There remains one single log flume boat, serving as flagship of "Diet Cola", the plantient chieftain. The Logue Folk are a harmless people, looking to live simple lives in the region surrounding the sunken park. If approached as friends, Diet Cola will ask the PC's for help freeing her son "Root" from the Reverse Aquarium. If the PC's can find this location, and bring back any lost Logue-Folk they find, they will be greatly rewarded (10 bags of fine sea shells). Logue-Folk: Init -1; Atk by weapon, +0 melee/-1 ranged; AC 12; HD 1d4; MV 30'; Act d20; SP: Hardened bark skin, 1/2 damage from blunt weapons; SV Fort +1, Ref -1, Will +0. AL L.
Once this pavilion was a celebration of everything about the United States and what made it such a great place. Now it is a broken down ruin. The exposed rooftop offers a single access panel that opens into a large auditorium. It's a 30' drop to the floor. Surprisingly there are no natural tie-offs on the roof, so PC's will need to come up with something else to tie off to. Once in the theater, the PC's are surrounded by tattered American flags, water-logged and moldy seats, rotten hardwood floors, and ancient view screens that once shared images of the USA's glory. Two entrances in the rear of the theater lead to a waiting area, where guests would gather before the show. Not sure which historical figure to use? The Judge has a couple of options. First, they can just pick one of their favorites. My daughter Carrie would easily say "Alexander Hamilton" for all of the aforementioned rolls. Another method is to just take a list of relevant figures, and turn it into die rolls. For example, as of this blog post there have been forty-four presidents, with the forty-fifth taking office shortly. So the Judge could use an electronic dice app to roll a d45, or maybe use a d50 ignoring results of a 46-50. Then just match that up to the presidential order. It's completely up to the Judge as to the value of these artifacts, or if they are even real. Chances are they aren't, but it's your game. This is actually an encounter that could signal the end of the adventure, as an artifact could be the entire goal of the quest. Perhaps the Cabal of Clinton or the Tribe of Trump want pieces of their namesake's past, and the PC's are on a mission to find this one structure. If that's the case, feel free to throw 1d4 Historical Animatronic's into the scene, each one the spitting image of a president! What better way to end an adventure than to battle an animatronic Ronald Reagon/George Bush tag team? Go crazy! Animatronic Historical Figure: Init +0; Atk punch +2 melee (1d6), or mouth-mounted lightning generator, ranged (1d8); AC 12; HD 2d8 (10); MV 30' (15' under water); Act d20; SP: Robot. Immune to all mind affecting powers. If destroyed, explodes in an electrical burst. All targets within 10' must make a DC 10 Fortitude save or take 2d6 electricity damage. SV Fort +3, Ref +0, Will +1. AL N.
Not far in the distance (within 1d100 feet) the PC's see a small floating case bobbing in the water. Upon closer inspection, it appears to be a sealed, watertight container with vague markings on the exterior. If the PC's examine the markings they will see faded images of both a smiling child holding a small wand as well as several radiation warnings and some small print that is too faded to read. Glowstick: TL: 2; CL 2; Range 30'; Special: Acts as a light source for up to 4 hours. Power source is an ancient, miniature plutonium device that is slightly unstable. If the Glowstick is in any way damaged, dropped, or tinkered with (causing the inner capsule and shielding to burst), it detonates. All living creatures within 10' must make a DC 12 Fortitude save or suffer 1d3 points of radiation damage. The PC's notice a small building not far beneath the waves. Although close enough to see, it poses no threat for the boat to pass above. Small bubbles rising from the roof of the structure reveal that there may be an air pocket below. PC's will need to swim down to examine the structure. Upon closer inspection, this is long closed Gift Shop that once catered to excited theme park guests. The building itself is not much larger than a kiosk, with two rooms. The first is 20' by 20', and is completely filled with water. This was the main shop area, with long rotted and destroyed toys, shelves, and other wares floating about behind a closed and locked (DC 12 to open) glass door. There is nothing of use in this area, unless the PC's are on the hunt for scrap metal or plastic. The second room is much smaller, but also virtually air tight. It is the old storage chamber, that also served as a fallout shelter for employees of the park. There are only two entrances into this 8' by 10' chamber. The first is the front door, which is stuck but can open with a DC 15 Strength check. The downside is that this will flood the room with water. The second is through the broken plumbing network that leads down into a fractured sewer pipe. PC's can swim down from the surface (30') to the pipe, then swim back up into the shelter, emerging from a busted toilet. Stuffed mascot that can record 10 seconds of the user's voice. Extendable grasping device with a working clown head and mouth at the end. 3' total reach. Baseball cap with logo of park. Medipac (Artifact, as per the Mutant Crawl Classics preview from the Goodman Games 2015 Gen Con Program Guide, page 189). Only one of these is available, so once a PC finds this, it cannot be rolled again. Consider another roll of a "7" to just yield some old gum. Teenage Manatee Manimals, or Manateenimals, roam the waters above the park in a makeshift, 30' long riverboat. The Manateenimal craft is on the lookout for other sentient creatures to place in their reverse aquarium. Their motives are unknown and mysterious, although the Judge can come up with their own plots. Perhaps the Manateenimals serve a dark and wicked master, such as Mutant Bipedal Sperm Whales, or something Cthulhu-esque. Eight Manateenimals are in the boat, each armed with a spear, on the hunt out for potential sources of entertainment. Manateenimals: Init +0; Atk by weapon, +0 melee/+0 ranged (1d8 for spear, the most common weapon carried); AC 11; HD 1d4; MV 15' on land, 30' in water; Act d20; SP: No penalties for actions under water. Can hold breath for 30 rounds, or 15 if exerting themselves; SV Fort +0, Ref +0, Will +2. AL L.
This is the Lair of the Manateenimals, a simple observation deck just above the waterline, and a large, empty, aquarium below. The aquarium area is 100' x 50' and 20' deep. It is filled with dirty moss, and random plant life that completely covers the bottom of the chamber. Aside from the 1d8 Manateenimal guards standing along an observation area above, there are 1d4 pure strain humans and 1d4 Logue-Folk trabbed below. Root (see the Mauler Mountain description) is one of the Logue-Folk. There was once a magical gateway to an area of the park called "Fancifuland". Or maybe it was called something else... it's been a long time! No matter, the beautiful and ornate archway still exists, just beneath the waves. Sometimes it sticks up out of the water, but not today. The PC's boat passes over the arch and gets caught by a long metal magic wand. This causes several things to occur. First, find out how many PC's were operating below deck. This is best to do before this encounter, especially since players will struggle with who they want exposed outside, and safe inside. Once the Judge knows who is below deck, find out which PC has the lowest Luck score. This PC get's impaled by the wand as it breaks through into the ship. The affected PC takes 1d4 damage, and is effectively pinned. The PC's need to remove the metal wand, either by breaking it with sheer strength (DC 20), or sawing it free (should anyone have tools or a device.) The wand has 30 HP. Once broken free, the giant wand can be wielded as a two-handed club causing 1d10 damage in melee. Of course once the wand is removed the boat starts to take on water. The PC's need to figure out a creative solution to patching up the hole in the boat, otherwise the vessel will take on enough water to settle completely upon the arch structure below. Until the water is bailed (1d6 hours with proper gear) and the hole patched, the vessel isn't going anywhere. Once a beautiful fairy tale castle served as a towering attraction at this sunken theme park. But now only the top 30' or so rises out of the water. Deteriorating in the hothouse climate, and covered in fungus and mildew, there's nothing appealing or wondrous about this relic. But at least the fireworks still work! Before the Great Disaster, the employees at the park loaded the firework launch tubes with some experimental, micro-nuclear devices. These were all the rage back in the old days, and the special designs they created in the skies above the park were considered well worth the risk of lobbing small atomics into the sky. Should the PC's approach within 30' of the Tween Queen's Castle, the last 1d6 launch tubes go off, shooting exploding images high into the heavens. -2 damage if wearing some kind of protective clothing, or if hiding under an object on the main deck. 10 - The 4D Experience - an experimental, time traveling ride that makes time slow down... in 4D! Once upon a time the "4D Experience" was the most technologically advanced ride at the park. To create an event that allowed for minimal guest lines with maximum guest experience, the amusement park engineers found a chemical way to allow guests to experience time travel. Sort of. The 4D Experience was a large movie-theater type chamber where guests would sit down in recliners. Once in their seats, a small halo would descend on the guests' heads generating a light mist. This mist contained a drug that slowed down time for the viewer. Then, a super fast 3D movie played in the theater. For the guest, everything played out in about thirty-five minutes. But the entire experience actually took only about three minutes. The roof of the theater can be found sticking out of the water, with a single access panel leading down into the structgure. A simple ladder leads down to a storage and HVAC room, with a door leading to the main chamber. Three hundred damp seats (fifteen rows of twenty) are all lined up in front of a tattered movie screen. While there are doorways leading out of the chamber, opening them releases a flood of water that will fill the chamber in 3d12 minutes. Should the PC's search the seats they will find that 1d3 of the 4D Experience Halos are still operational. 4D Experience Halo: TL: 4; CL 3; Range Self; Special: Slows down time for the user by 90%. While this does not allow the user to move any faster physically, their brain can still operate at this increased speed, allowing for improved problem solving. All physical actions, including reflex saves, attack rolls, and damage rolls, are made at a +3 bonus. Lasts for 3 minutes (or 30 experienced minutes). Each halo only has enough mist for one more use. The judge should feel free to come up with their own concepts for the movie that was played, or just borrow from their favorite animated features. The PC's see a small, metal rocket pod sticking out of the water just a couple of dozen feet from the ship. Not far from the rocket (about 25') there is a long weathered metal pole sticking out of the water. Upon closer inspection, it looks like an old, spinning rocket ride, knocked onto its side. There are eight total rocket pods, each one tethered to a central spoke that is tilted at a forty-five degree angle underwater. This is the only rocket pod sticking out of the water, as the other seven are in a lowered position. Should the PC's approach the pod, they will notice that there are some remains of a dead creature on one of the seats. A water breathing mutant "mariner" sought refuge hear several years ago, but died due to an infection. The mutant was wearing a suit of sharkskin leather armor (+3 AC, 1d8 fumble die, no check penalty when swimming), wielded a sharktooth knife (1d4 dmg), and had a small satchel filled with jars of International Geologic magazines. Entering the pod to retrieve the gear requires a Luck check. Should the PC fail, the ride begins to operate again, dragging the PC under water (DC 15 Strength or Agility check to get free.) The ride operates very slowly, and it takes six rounds to make a complete revolution. The character is at risk of drowning during this time. Whether it's a rabbit, mouse, rat, or cute panda, somehow the PC's have managed to unleash a truly terrifying site... the Mascot Kaiju! A product of rogue nanotechnology, coupled with thousands of years to build a living and breathing monstrosity may just lead to the death of the party. The creature rises slowly from the waves, first it's ears and head, and then face, and then the rest of the body. Altogether the Mascot Kaiju is 100' tall, and is really, really grumpy! Mascot Kaiju: Init -2; Atk smash +9 melee (1d12); AC 18; HD 8d12 (40); MV 50' on land, 20' in water; Act d20; SP: Capsize Boat as an action, flipping it on it's side. All on boat must make DC 12 Reflex Save or be flung into the water; SV Fort +8, Ref +2, Will +4. AL C.
The Mascot Kaiju has roughly the same speed as the PC's boat, so this may lead to an epic chase. The PC that is in charge of controlling the ship must make an Intelligence check each round for sailing knowledge. The DC is a 15, and each assisting PC adds +2 to the check. Keep note of who these acting characters are, as they are not permitted to act in a subsequent combat round. Should the PC's make the check, the boat escapes the Kaiju for the round. Should they fail, the Kaiju catches up and can either attack a PC or try and Capsize the boat. Three successful Intelligence checks result in the boat outrunning the Mascot Kaiju, and the creature loses interest. But it may be back! We hope you've enjoyed our short, post apocalyptic, theme-park inspired adventure! If you have a chance to run this for your own group, or even just use an encounter or two, please let us know. If I get enough feedback I may add a few more encounters!